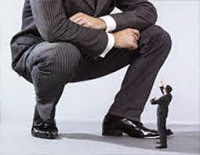 The Australian Small Business Blog: Daddy, where do jobs come from- Big Business or Small? Daddy, where do jobs come from- Big Business or Small? While the media tend to ignore small business, politicians of both major parties will say that small business is the growth engine of the economy, although organising them to support their policies is like trying to herd cats. Even so, with 47% of private sector employees producing 30% of our GDP, together they are a powerful force in our economy. When a big business such as an auto manufacturer shuts down, it makes big headlines with union bosses, who have been sabotaging the company’s profitability and ability to manage for years, complain how unfair it is and demand government intervention to protect jobs and even bigger handouts. Unfortunately several thousand jobs will go when this happens, and just as importantly small business suppliers are also hit. While big businesses such as car manufacturers receive billions of dollars, with taxpayer support for each auto job of around $50,000, small business owners have to manage on their own. Suppliers to failing big businesses have to innovate and seek other markets for their skills to survive. They won’t get handouts. So where does job growth come from? Firstly it can come from incremental growth in demand. All boats are lifted on a rising tide. The second way is through innovation. Generally, small businesses are innovation incubators as they are more willing to take risks. Big companies, on the other hand, innovate in three ways. Some, such as Apple, innovate through internal research and development just like their smaller brethren. They can also innovate through collaboration with smaller businesses. Then there is lazy innovation - buying a start-up with the technology they want. While big business may not be the best innovators, what they can do well is finance the commercialisation and marketing of the new products. How many jobs does this innovation create? In the case of Apple, it is 50,000 employees, 70% work in their retail stores but almost none in manufacturing. It contracts another 700,000 to build its products, mostly in Asia. To bring one of these facilities to a developed country like Australia, or even the US would require subsidies that governments can’t afford. This is not just because of the cost of labour, which in high tech industries is a relatively low cost component, it’s also the manufacturing infrastructure. Steve Jobs reportedly said that America doesn’t train people to do this kind of work anymore. The iPhone it needed 8700 industrial engineers. Apple estimated it would take 9 months to find so many in the US. In China it took 15 days. In addition, in highly unionised businesses in countries like Australia, as it is very difficult to fire an employee, there is a reluctance to increase employment, with automation and outsourcing the preferred options. Small businesses don’t have these restrictions. Small and large businesses view growth opportunities in different ways. In most small businesses, the owners are also the managers. A board of managers in a big business must report to their shareholder owners. Their ability to take risks is limited. An entrepreneur with a new idea in which they passionately believe, don’t have to convince risk adverse shareholders, although finance is often problematic. Of course it often doesn’t work out. We tend only to hear of successes. In large businesses, the approach to risk taking is more professionally managed, which means one or two bad ideas won’t take down the company, so growth is slower, albeit less erratic. Ultimately small business owners are more ambitious, often telling me how they would like to double in size in five years which, with the right guidance, can be a very realistic objective. Given that their market share might be a percent or two, doubling in size usually doesn’t require much if any market growth, rather just to be that little bit better than their competitors. On the other hand, if you have 20% market share, doubling it requires major market changes which means that growth is more incremental unless they have gamechanger products like Apple’s iPod. With the perceived growth opportunity for small business, their focus is on top line (revenue) growth, even if in the short term that growth is not highly profitable. Their strategy is to test and refine their business model and build their market share which usually requires hiring staff. Their focus changes only when they see their growth starting to plateau. This is often caused by inadequate systems which affects productivity and consistency in service delivery, impacting on profit. This requires a consolidation, after which the focus returns to growth. Large companies are far more bottomline focused (particularly if they are listed). When they can’t grow their revenue, they will look at reducing their costs so their profits can still grow. They do this through automation, productivity increases and outsourcing non-core parts of their business. All of which means reducing the number of jobs. The downside of new jobs in small business is that they tend to be less stable than larger business as their profitability is more volatile. However, not even big businesses last forever. (Remember Kodak?) When a big business fails, losses are far greater, capturing the headlines. If they don’t fail, they are bought out or merged which also results in job losses. To produce this growth in jobs, small business don’t ask for handouts, just a level playing field, and for reductions in red tape which hurts small businesses far more than big ones. Red tape increases barriers to entry and reduces competition for big businesses who feel less pressure to innovate. Apple started out as two guys working in Steve Job’s parents garage hiring local kids to build their first computers. Their rate of job growth was highest when they were smallest. 1. Start collecting data for your current Profit Driver Performance. 2. For each Profit Driver develop strategies for improvement. 3. As you implement these strategies, monitor the impact on each of your Profit Drivers and your Gross Profit. Dr Greg Chapman is the author of the award winning best seller, The Five Pillars of Guaranteed Business Success. Visit Empower Business Solutions to learn more about marketing your business and a Free preview of his book. Share this article:Daddy, where do jobs come from- Big Business or Small?